Welcome to the Friends of Attleboro Animal Shelter’s “Happy Tails” page. We are pleased and proud to showcase information and photos of former shelter animals that you adopted into your loving homes. Happy Tales about Happy Tails is what we are all about! We all love her very much. We want to hold and cuddle with her all the time, but we are still trying to give her some space. The kids have been very understanding with that. Unfortunately the name that I had thought was cute (Flower), was voted out. We have been calling her “Baby” and “Little Kitty”. But still thinking the perfect name will come up. It’s hard when you have 5 people to please. She is still a bit skittish, and runs when you try to pick her up. But she LOVES her food, and you can generally pat her while she is eating. Once you get her, she will sit with you and purr, we all love that. She just loves Squeaky so much, and the whole thing was a bit of a blessing in disguise……because Squeak is a bit over-weight, and we need to start to manage that before he gets older, to prevent diabetes….so he has been running around and playing like never before, and plus “Little Kitty” eats all her food, and then Squeaky’s…….instant diet, and exercise plan!! My husband and I adopted Tally Cat #2(with the orange collar), we named him, Oakley. He is a little ball of chaotic energy but we love him! He loves sleeping with us at night and then waking us up by chewing on our chins It took a couple days for our other cat Scout to get used to such a hyper little black and white kitten but the two have become fast friends! Thank you so much for the great work you do and thank you for our new little family member! loving and loveable member of our family now. Thank you so much! Maybe you remember Luke? he’s the special guy fighting cancer and FAAS gave $500 to his family last year at the Furr-Ball, to help out with some of his vet bills. His family wanted to let us know that he just turned 3yrs. old! and he’s still “Hanging in there!” Good luck Luke! This is my “Happy Tail”. I hope you will post it-even though we adopted Lexi in September, 2006! As you know, a lot of dogs of this breed get a bad rap. Well, Lexi has been doing fine in her forever home. We have had a couple of hiccups along the way, but we all love her. She is the only animal in the house with 2 parents and a 17 year old buddy. The reason we adopted Lexi was due to her ability to play “soccer”. My son has played soccer since he was in kindergarten. We have 2 acres of land for Lexi to play with her beloved red ball. Yup, that’s right; she still has her ball that came home with us from the shelter! She still loves her kiddy pool, especially after playing soccer for awhile. She has been seen by the same Vet and has never gotten into doggie trouble with animal control in our town. She has become somewhat of a social butterfly. She is friendly with a chocolate Lab and a larger Chihuahua mix that live in our neighborhood. She loves to ride in the car, and just recently she went for a ride in our RV motor home. She loved that; she could look right out the windshield from behind the driver seat. We thank the shelter for putting us together. I wanted to drop you a line and let you know Tessie (formally Onica) is doing great! She and Rocko are best buddies! She is such a love bug, her antics and personality is one of a kind. When you yell “No” she will stop, look at you and run to you for your forgiveness. She is also a little instigator and doesn’t know when to stop when it comes to Rocko. House training is complete and the other training is coming along great! Its a little harder with two but its coming along. I keep telling Rocko he needs to be the example. Dunkin is much more lively today! Yesterday he was a little groggy (understandably) and I think he thought he had done something wrong because he was extra cuddly. Today he seems much, much better and is back to his old self. He is very upset though that we haven’t been throwing things for him to bring back or taking him for long walks.. he keeps looking at us like we’ve been boring the last few days. Soon enough he can go back to daycare and play with all of his friends and everything! Everyone in the waiting room couldn’t believe he was from the shelter.. we have told so many people that he came from the Attleboro animal shelter and they are always impressed because he’s so cute and well behaved.. hopefully we have encouraged others to go adopt!!! Here is CH1 aka Emma and CH8 aka Fred reunited in their new home together! WE LOVE THEM!! Jack & Gussie – here are some recent photos of the “boys”. They like to watch the birds from one of the windows or the front door. they get along great with the dogs and love to eat salmon. We love them!!! Darling – Maeshowe is doing very well; in fact, we encourage folks to look twice at older, fat cats, as personality is a big plus when choosing a pet! Maeshowe has finally accepted our resident cat and things have settled down to a reasonable co-existence. maeshowe is a trip. We found out that she has a “Show Fetish”; she practically tries to wear our shoes when we take them off – too funny. She is becoming content and less needy with her food. She has gotten her muscle tone back and is very strong. She’s also cute! We love her! 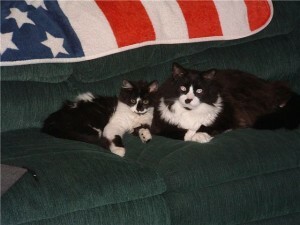 Effie – The cat you saved named Opal Mom is doing very well. I’ve re-named her Effie and she is a bundle of energy, very loving, and I very much look forward to seeing her first thing in the morning and after work. She has found all sorts of hiding spots to squeeze in and out of around of my place. She also is a natural at fetch — bringing socks and toys from room to room. We are a great fit for each other. Thank you!!!! Fezzik – We adopted Dwight as a kitten a year ago, but realized after months of his crying due to boredom that he needed a playmate. So we went back to the Attleboro Animal Shelter in May and found Fezzik, a two-year old feral cat who was rescued by the shelter. They placed him up for adoption because he took amazingly well to people. After waiting for three months we came by and instantly fell for the big guy. We have never met a nicer cat. He’s amazing with everyone. We can pet him for hours and he literally cries for a lap to sit in whenever we’re not sitting down. Fezzik and Dwight get along wonderfully together. They interact a lot. They’re amazingly good friends who sleep side by side every night. Dwight is still very shy around people, but Fezzik is slowly drawing him out of his shell. Fezzik has quickly turned into the big brother we needed for Dwight and the lap cat we always wanted. Thank you so much! Wessie – My husband and I adopted a kitten from your shelter in November of 2006. I wanted to let you guys know that she has been such a great addition to our family. She has the best personality, she is very loving, loves to play, and is always right with one of us at all times. She is the best kitty anyone could have asked for, and we could never imagine a world without our little Wessie! Lastly, I wanted to thank you guys at the shelter for all that you do–you take care of all of the animals that come in needing your help, no matter how hard it would be, and help them find homes that they know they will be loved in. Wessie has brought so much joy to our lives, and we thank you for everything that you do! Rajah – I’d like to inform you good people that Rajah (adopted in July 2005) has found a very, very happy home. 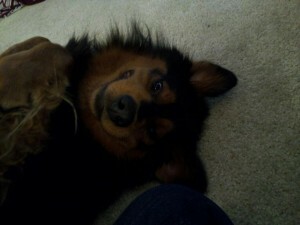 My fiance and I absolutely adore him and he’s an integral part of our household. He’s got some idiosyncrasies, mind you — he likes to chase his tail, he fetches toys, he likes to poke his head in while I’m showering — and we think that makes him more endearing. He also poses for Halloween photos with good grace. Thanks so much for our kitty! Kit – Kit is doing great! He has adjusted really well and loves it here. He’s got a bunch a space to run around and play and seems really happy. Although he’s still tiny, I can tell that he’s getting bigger and stronger. When we first brought him home, he couldn’t get up onto the couches by himself; now he’s jumping up on them like it’s nothing! Rocco – Rocco is doing awesome! He gets along great with our chihuahua, Yoda, although Rocco always keeps an eye on him. We made a temple for Rocco out of a box, and he loves to hide in it and pop out and scare Yoda! If we leave to go out, we come home and find him waiting for us at the door. Roc has made himself so at home, it is like he has always been there. Jack – Last fall we adopted one of the kittens you named “EB kittens.” Well, Jack just turned a year this month, and I wanted to pass along his picture to you. As you can see, he’s a beautiful cat, and we’ve loved every minute of him. We actually adopted a ‘brother’ for him to play with earlier this summer from a friend of the family. Izzy – As soon as I saw Izzy on the “Pet of the Week” video, I knew she was the cat for me. So large she came in to the Shelter in a laundry basket, Izzy is just the softest kitty with a deep, deep coat. I was lucky that Izzy knew I was the one for her. We nap together in the recliner; I’d purr along with her if I could. I am so lucky. Thank you for my girl! Maxwell – I thought you might appreciate this photo of Maxwell, who we adopted from your shelter in August, 2005. He is doing great, just a superb dog all around. My parents took care of him for two weeks while my husband and I were traveling, and my mother said that if all dogs were as good as Maxwell, everyone would have a dog. I’d love to adopt another, but I think Maxwell likes being the only canine in the house! Thank you so much! Emma – We wanted to let you know that Emma is doing great! She’s stopped biting now and is loving her home. She’s a fun loving dog and a ton of joy for us and our family. I’m so glad I sought her out and adopted her. After 2 months, she is doing just fine. You all did a great job by not giving up on her. I’m sure that Emma appreciates it, too. Keep up all the good work you’re doing! Leeza – As you can see, only one day in her new home and Leeza is right at home. She is a total lovebug. All she needed was to get out of the cage. She will be a perfect fit for our family. Thanks so much! Harlan – To look at this photo, you’d think Harlan had been living here for years instead of just a few short weeks. Already he is good friends with Daisy (whom we also adopted from you); the other night they were chasing each other’s tails. Harlan has taken a liking to catnip toys and it is soooo funny: he will grab one and toss it, then pick it up, WRESTLE it, and then fall over backwards. He still expects his food to be brought to him, but sure knows the sound of the treat cabinet when it opens up! CJ – This beautiful girl is doing very well in her new home. She was a bit tentative at first, which is to be expected, but she has quickly adapted and is very excited when she hears the leash. She has a good appetite (which will be no surprise to you) and is now playing with her toys and getting settled. Even though CJ is an older girl, she is a great fit for us, and we promise to take great care of her. We are completely in love with CJ! Rocky – We have named our new puppy Rocky! He fits in so perfectly with our family you can see from the photos. He is a cute, lovable guy, and Cody (his older Newfoundland brother) has taken him over. We absolutely adore this new addition! Thanks for such a wonderful puppy! Stella – This is seriously the best dog in the world. I wanted an older dog mostly because my aunt was recovering from brain surgery, and I’m glad to say that she’s back 100%, but I swear the reason is Stella. Even with her bad knees, my aunt gets down on the floor to give Stella belly rubs. Then she has a problem getting back up, so she tells Stella, “Help me up.” So Stella gets up and nudges her in the backside! My mom plays hide and seek with her, and Stella gets all wiggly when she finds her as it’s one of her favorite games. Thank you so much for taking such good care of Stella before we could find each other. There is no doubt in my mind, she was the dog that I was always meant to have, and I love her with all my heart. Orange Julius – He now lives with dogs and kids who absolutely love him and think he’s the coolest thing ever. After all, they came all the way from New Hampshire to adopt him! Here he is drinking from the dog’s water bucket. I’d say he looks pretty well adjusted and happy, wouldn’t you? Keep up the good work everyone; this is why we volunteer! Bruno – I’ll tell you, it didn’t him long to adjust to living here. His first few days were spent behind the refrigerator, then in the wall behind the bathroom. You all told me there was adjusting, and I read up on it too. Well voila, he was my alarm clock at 3 am one day (lucky for me I was actually going to work that early that day). He has been out ruling the place ever since. When I’m on the computer, I think he wants to (or may have already) send emails. He also likes to chase the cursor on the screen. Bruno is now a spoiled only cat in this household. Oh what a life for him! Volunteering at the shelter I keep finding new favorites, but it wouldn’t be fair to have another cat here because Bruno rules! Sabriel – I’m doing very well at my new home and get plenty of love and attention from my new friends Karen and Dan. They bought me a bunch of new things! I got a kitty condo, a fuzzy bed, some cat nip toys, and some balls that I like to bat around. Some of the places I like to hang out are on the back of the couch and in the linen closet! But my favorite places are the fuzzy bed they bought me and their big bed; and if I feel like it, they let me sleep with them!!! But even when I decide to sleep in my own bed, I always go upstairs around 5:30 am to remind them that it’s time for my breakfast. Believe it or not, I get greeted with hugs and kisses even that early in the morning. Boy they must really love me! I finally found my forever home with my humans who I know love me very much. Scout – We found Scout on Petfinder which directed us to the Attleboro Animal Shelter. There were 9 Rotti/Shepherd mix puppies who were 8 weeks old. The whole process went quickly and smoothly. Scout is now 1 year and 4 months old. He is the most gentle, loving, snuggly, tolerant, funny, smart, great dog you could ask for. We have 4 children, and they adore him as do my husband and I. In spite of his developing severe hip dysplasia, we love him soooooo much. We do our best to keep him as comfortable as possible and limit his exercise to what he can tolerate. It’s hard to watch, but we wouldn’t trade him for anything – Scout’s the best! Here is last year’s Christmas picture and, as you can see, he is quite handsome! Monty – Monty is so much fun! He’s very vocal, mumbling and grumbling when he doesn’t get his way. He loves to snuggle and gets right up there and parks his big head on our shoulders. He gets along great with his two sisters, Murphey and Mabel; he and Murphy chase each other and wrestle all day. Here they are resting up for the next round (Monty is the red and white bassett). We’re very, very happy with Monty. Thank you so much for hooking us up with an excellent dog! – I just received Taz’s medical papers in the mail, and it reminded me to write you. She is absolutely one of the most wonderful cats ever! She has made the past week one of the best I’ve known, and has quickly become the baby of our family, despite her 9 years young age. My fiance adores her too; we sit every night on the couch, snuggling and watching TV with her. She snuggles by at bedtime, and I wake to her sweet face awaiting me every morning. She is truly my little buddy! I took your advice on her catnip addiction and spoiled her with toys and treats… even bought a live catnip plant, which she loves. I don’t think I could be any happier with her and, seeing how happy she is with us, makes me feel as if it was meant to be! Thank you for the dedication you show and the selfless work you do. – Well, it has been a year since I adopted Nikki. He’s the little white one on the left, sitting next to his best friend, Sammy. Don’t let that adorable face fool you, though; he is one tough cookie. I had to work very hard to gain his trust and respect. He tended to lunge and snap at people if they moved too quickly towards him. Anything I would have in my hands when I went near him caused suspicion and aggression. Thanks to the TV show “The Dog Whisperer,” a lot of research, exercise, and socialization, his improvement has been dramatic. He has a lot of doggy friends and people he loves, and we go walking with them every evening. He is a pretty happy camper now, and I couldn’t ask for a better companion. Now Nikki has become a neighborhood favorite; people remark at how much better he is. I love him to death and am so happy he found his forever home with me. It’s not always easy to recognize a diamond in the “ruff,” but I highly recommend adopting a rescue dog. It is totally worth it. – Remember this guy?? Glacier and Lexus aka Fric and Frac! Glacier is doing just great. He loves his sister Lexus very much. They enjoy running full speed ahead through the yard. They run right next to each other barking and wagging their tails. Glacier loves to throw a few spins in when running to try and knock his sister down. Since she weighs 8 pounds less, and thus has a lower center of gravity, tends to knock him over. The two of them are cause for much laughter from the neighbors and visitors. They are two definite clowns, and we could not have asked for a better adoption. Both of our pit bulls have the best dispositions and are ambassadors for the breed. They meet every visitor with wagging tails and if someone is brave enough to bend over, they will get the “never ending bully kisses” simultaneously by both dogs! – As you can see, Roz fits right in. She loves to play with the kids and adopted brother Samson whom we rescued in January, 2006. They just love each other. They are both a great part of are family, and we love them. Shadow – I just wanted to let you know that the “Love of our life” is still with us. He has given us sooooo much joy and love over the years that I just wanted to let you know he is still with us. He is walked up the Blue Hills 3 times a day, has a wonderful home and has many dog friends that he walks with everyday. You all have done such a wonderful job just wanted to let you know the happiness he has brought us. We got him when I believe he was 3 years old and probably will be 13 next January. His name now is Shadow. We just love him dearly. – We have named him Rockey! He fits in with our family so perfectly! He is a cute lovable puppy! We adore him! We could not come over last Saturday my daughter had basketball but will try to bring him & Cody by this Saturday to return the sweater. Thanks so much for our wonderful puppy! – My Dad had a knee replacement. Charlie is with us, and has adjusted very well. He is great in the house, only one pee pee accident and is crate trained. He is crazy for squirrels on his daily walks. The kids love him.